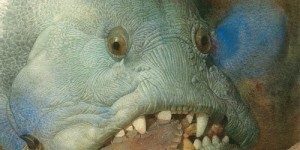 Space does not interest me, unless Captain Kirk is commanding it or aliens are descending from it. There are many reasons, but primarily I blame David Bowie. I heard Space Oddity at a formative age, when my base level of fears was just settling in for a lifetime of anxiety. The idea of ‘floating in a tin can’, no longer tethered to the comforts of fresh fruit and gravity, terrifies me. Good thing the chances of this happening are slim. I’d probably have to redo grade 12 math. What has caught my attention is the Canadian astronaut and social media star, Chris Hadfield. As commander of the International Space Station from December 21st, 2012 to May 13th, 2013, I was riveted by his Twitter feeds from space. Ironically, while the science of space travel via Hadfield’s comments and video demonstrations have been fascinating, it’s his celebration of Earth that has truly captured my attention. 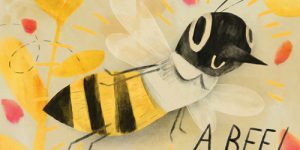 Bored by my growing obsession with all things Hadfieldian, my niece said, ‘space has always been cool Auntie.’ I suppose, but poor old Earth is fraught with buzz-kill issues, especially of late. Urgent environmental concerns have focused attention on the negative: the pollution, the extinctions, the catastrophic weather events. Hadield’s optimism and unfailing enthusiasm has done an amazing thing: showed us what’s right with the world. Stunning photographs of the earth, taken from space, have shifted our perspective, at least for a while. It is a beautiful world. Chris Hadfield’s words and photographs speak for themselves. 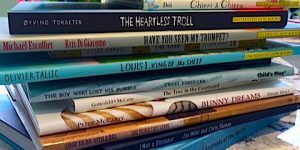 Hopefully there will be a book at some point. 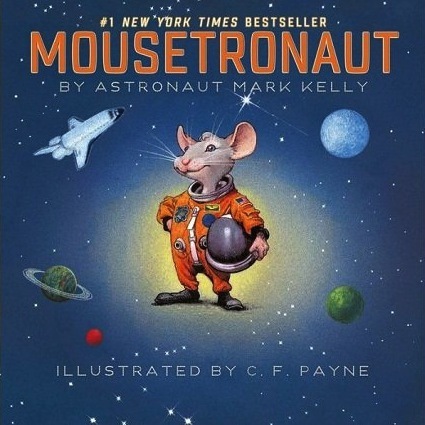 In the meantime, his American colleague, astronaut Mark Kelly, has written a picture book about space travel called Mousetronaut, illustrated by one of my favourite artists-C.F.Payne. It’s not his experiences per se, but those of a mouse named Meteor, one of six mice taken aboard the space shuttle Endeavour as part of a research mission. 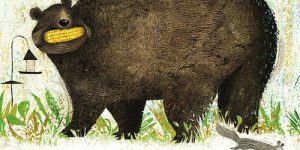 Meteor is small, and at first he believes his tiny stature will preclude him from joining his more robust compatriots, but once aboard, Meteor shows his true measure. Enjoying the feeling of weightlessness in zero gravity, Meteor is given a tour of the ship, while the others cling to the sides of their cages in abject terror. When an important key gets stuck between the control panels, the little mouse squeezes through the crack and retrieves the key, thus saving the mission. 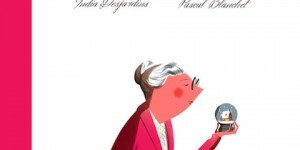 To great acclaim, Meteor is given a uniform and an official title~Mousetronaut. 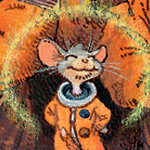 Considering the complex nature of space travel, Kelly has cleverly focused his story on a small, but resourceful mouse young children can relate to, while leaving C.F. 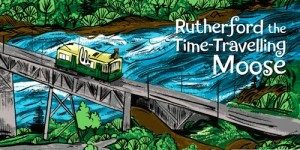 Payne to carry the scientific heft with his spectacular artwork. 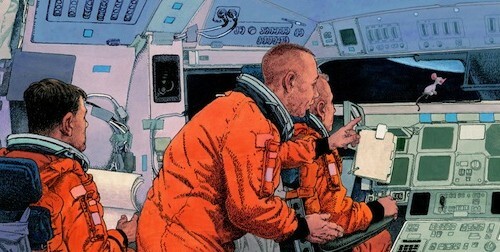 His depictions of space and spacecraft are truly stunning, as are his detailed illustrations of control panels, space gear, and the individualized faces of various characters both human and rodent. 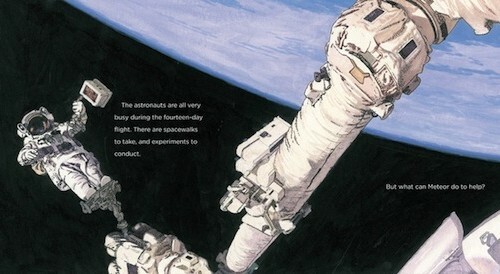 His playful use of perspective, with brush strokes looser and less saturated than in other picture books (that I’m familiar with), gives Mousetronaut a graphic novel feel in scenes involving the astronauts and NASA staff. 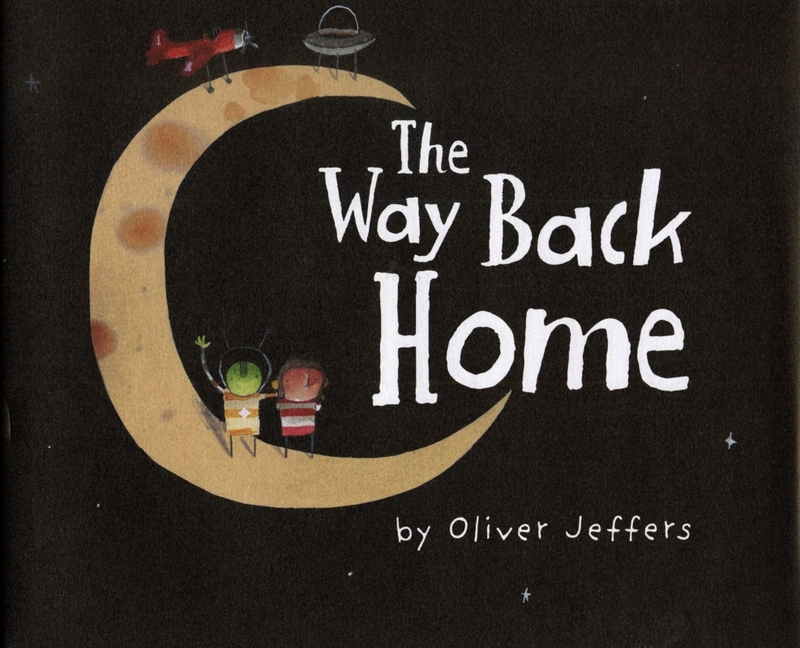 Continuing in this astronomical vein, Oliver Jeffers’ The Way Back Home also involves a trip to space, but there are no astronauts, just a boy and a tiny green alien. 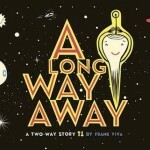 The book begins with this sentence: “Once there was a boy, and one day, as he was putting his things back in the cupboard, he found an aeroplane.” I’m not sure which scenario is more unlikely, a kid putting his stuff away, or finding a plane in the closet. 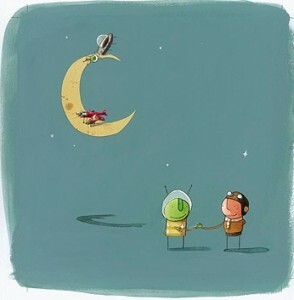 In any case, the boy flies into space, only to run out of ‘petrol’, requiring a forced landing on the moon. When a Martian ship crashes on the moon, the boy is terrified, as is the Martian, but once they’ve exchanged stories, the fear dissipates, and they agree to help one another. 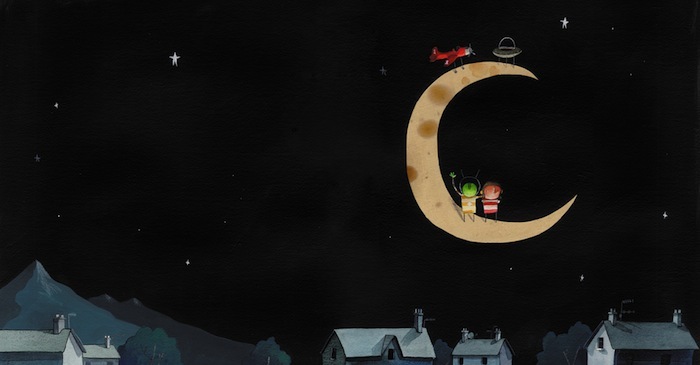 In Oliver Jeffers’ world, details, like physics and occasionally logic, are irrelevant. It’s all about imagination. Using a parachute, the boy jumps down to the sea and swims home. Once there, he falls asleep with his penguin (from Lost and Found) in front of the television and almost forgets about his little green friend. When he does remember, the boy collects his tools and calls for the Martian, who hoists the boy back up to the moon with a rope. The ship is repaired, and the aeroplane’s tank is filled. 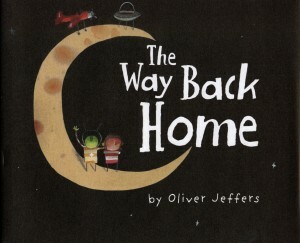 Each return to their respective homes, although the unexpected delivery of a radio monitor to the boy’s home suggests their communication has not ended. Like Chris Hadfield, Mark Kelly, and C.F. 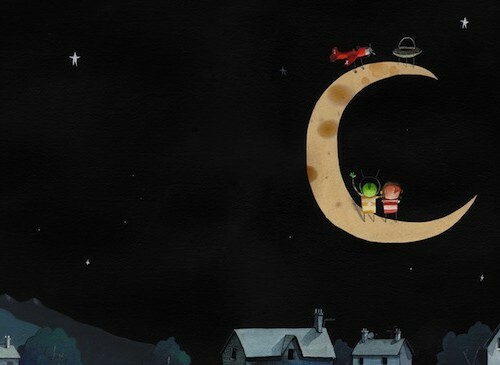 Payne, joy is at the core of Oliver Jeffers’ particular form of expression. It’s infectious. 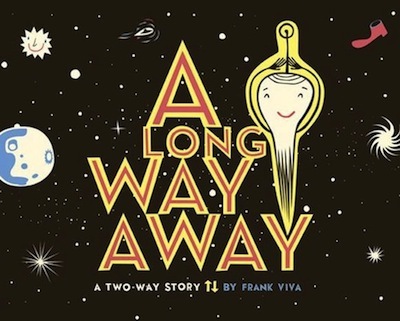 I may not feel any inclination to see space firsthand (that grade 12 math thing again), but I am ever so grateful to experience it via beautiful art and great storytelling.